The autonomous torpedo is among an array of new strategic weapons being developed by Moscow as part of a nuclear modernization underway over the past decade. Russian nuclear modernization includes multiple upgrades for older missiles, launchers, bombers, and submarines, according to an internal draft of the Nuclear Posture Review, a major policy study to be made public in final form later this month. The draft was published last week by the Huffington Post and labeled "unclassified/for official use only" and "pre-decisional." The report states that the new strategic arms are in addition to the modernization of legacy Soviet weapons, and "multiple upgrades" for all legs of Russian nuclear forces including strategic bombers, sea-based missiles, and land-based missiles. "Russia is also developing at least two new intercontinental range systems, a hypersonic glide vehicle, and a new intercontinental, nuclear-armed, undersea autonomous torpedo," the report says. The report does not provide further details. However, the Washington Free Beacon first reported the existence of the drone submarine in September 2015. Two months later, Russia revealed on state-run television a document showing the drone is known in Moscow as the Ocean Multipurpose System Status-6 and is being developed by the TsKB MT Rubin design bureau that built all current submarines in service with the Russian navy. A test of the drone was conducted in November 2016, an indication the weapon is a priority nuclear program. Defense officials have revealed that the drone submarine, code-named Kanyon by the Pentagon, will carry a very large nuclear warhead up to 100 megatons that will be capable of destroying entire port cities or harbors. The Russians likely would use the nuclear drone torpedoes in a nuclear conflict for targeting the ballistic missile submarine bases at Kings Bay, Ga., and Puget Sound in Washington state. Officials said the Kanyon likely will be outfitted with warheads in the "tens" of megatons. A megaton is the equivalent of one million tons of TNT. A blast of that size could create massive damage over wide areas. Additionally, the drone torpedo will be capable of traveling underwater at high speeds over long distances. The United States has no plans to build a comparable underwater nuclear torpedo. The Navy has said that developing unmanned underwater vehicles, or UUVs, is a high priority for future Navy forces. 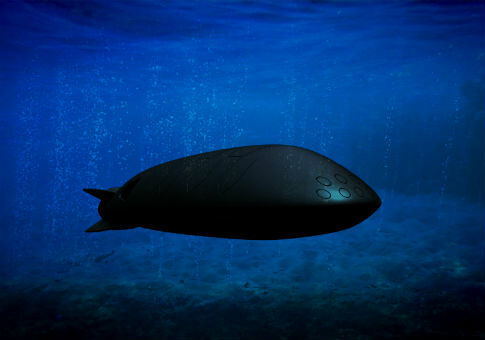 Development of the long-range nuclear-armed drone submarine could prompt the Navy to develop new underwater attack submarine capabilities. The Russian nuclear forces threat is a major element of the posture review. Others include an aggressive nuclear buildup by China and North Korea, and the potential for Iran to build nuclear arms in the future. On Russia, the draft report also warned that Russia is building "a large, diverse, and modern set of non-strategic systems that are dual-capable (may be armed with nuclear or conventional weapons)." These tactical and theater-use nuclear arms are not covered by the 2010 New START arms treaty. The numbers of Russian tactical nuclear arms are increasing along with significant improvements in delivery systems—missiles and aircraft. Russia has violated the 1987 Intermediate-range Nuclear Forces Treaty with a new ground-launched strategic missiles. "Moscow believes these systems may provide useful options for escalation advantage," the draft report said. Russia also is modernizing its nuclear-armed ballistic missile defenses. "Russia's increased reliance on nuclear capabilities to include coercive threats, nuclear modernization programs, refusal to negotiate any limits on its non-strategic nuclear forces, and its decision to violate the INF Treaty and other commitments all clearly indicate that Russia has rebuffed repeated U.S. efforts to reduce the salience, role, and number of nuclear weapons," the report said. The comment is a veiled criticism of the nuclear policies of former President Barack Obama who ordered the Pentagon to reduce the role of nuclear weapons. As a result, U.S. nuclear forces have significantly atrophied and are in urgent need of costly modernization of both weapons and the infrastructure used to produce and maintain them. The forthcoming posture review will call for a new nuclear strategy called "tailored deterrence" that seeks different ways to deter nuclear adversaries. For Russia, the posture review said the most worrying aspect of the nuclear threat is the combination of a new doctrine emphasizing the use of nuclear arms and the expansion of diverse nuclear weapons and capabilities. "Moscow threatens and exercises limited nuclear first use, suggesting a mistaken expectation that coercive nuclear threats or limited first use could paralyze the United States and NATO and thereby end a conflict on terms favorable to Russia," the draft report said. "Russia must instead understand that nuclear first-use, however limited, will fail to achieve its objectives, fundamentally alter the nature of a conflict, and trigger incalculable and intolerable costs for Moscow," the draft report says. American strategy will seek to ensure that Russia knows that any use of nuclear arms, however, limited, will be unacceptable. To deter Russia, the United States will threaten "what Russia's leadership most values," the draft said. In backing the tailored deterrence, the Pentagon will prepare an expanding range of limited and graduated options, including greater protection of nuclear command and control systems. This entry was posted in National Security and tagged Drones, Pentagon, Russia. Bookmark the permalink.